This is the third post of a three part series the religion of the ancient Egyptians. Part one can be read here and Part two can be read here. Temples were a part of Egyptian history from the very beginning, and could be found in most towns at the height of Egyptian civilization. 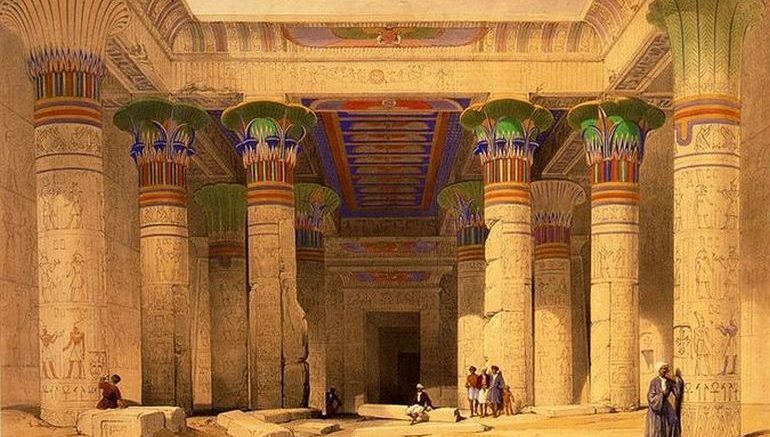 There were both mortuary temples designed to serve the spirits of deceased pharaohs, and temples dedicated to patron deities, although the difference wasn’t always clear because the concepts of divinity and kingship were so intimately intertwined. For the most part, state-run temples were not meant to be places for the general public to worship. Instead, these temples functioned as houses for the deities, whose physical images, like statues, acted as their surrogates, and were cared for and given offerings accordingly. These services were considered necessary to sustain the deities, so that they, in turn, could maintain the universe itself. Thus, temples were fundamental to Egyptian society, and vast resources were devoted to their upkeep, which included both large estates of their own, and donations from the monarchy. Pharaohs often expanded temple estates as part of their obligation to honor the deities, which resulted in many temples growing to enormous size. However, not all deities had temples dedicated to them, as many deities who were considered important in official theology were only minimally worshipped otherwise, and many household deities were the focus of universal reverence rather than temple ritual. The earliest Egyptian temples were small, short-lived structures, but through the Old and Middle Kingdoms they became more elaborate, and were increasingly built out of stone. By the New Kingdom, the standard temple was built along a central processional way that led through a series of courts and halls to a sanctuary, which housed a statue of the temple’s deity. Admittance to this most sacred part of the temple was restricted to the pharaoh and the highest-ranking priests. In addition to the actual temple itself, temple complexes also included workshops and storage areas, and a library where the temple’s sacred writings and everyday records were kept, and which also served as a center of learning. In theory, it was the duty of the pharaoh to carry out temple rituals, since he was Egypt’s official representative to the deities. In reality, priests almost always carried out these ritual duties. During the Old and Middle Kingdoms, there was no separate class of priests; instead, many government officials served in this capacity for several months out of the year before returning to their secular duties. It was not until the New Kingdom that professional priesthood become widespread, although most lower-ranking priests remained part-time. Temple staff also included many people other than priests, such as musicians and chanters for temple ceremonies. Outside the temple itself were artisans and other laborers who helped supply the temple’s needs, and farmers who worked on temple estates. All were paid with portions of the temple’s income. As a result, large temples were very important centers of economic activity, sometimes employing thousands of people. State religious practice included both temple rituals involved in the cult of a particular deity, and ceremonies related to divine kingship. 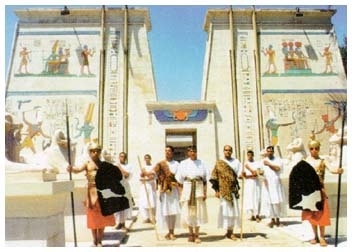 Among the latter were coronation ceremonies and the Sed festival, a celebration and ritual renewal of the pharaoh’s strength that took place after he had held the throne for thirty years, then every three or four years after that. Temple rituals included rites that took place all across Egypt, and rites limited to single temples or to the temples of a single deity. Some were performed daily, while others took place annually or occasionally. The most common temple ritual was the morning offering ceremony, performed daily in temples across Egypt. In it, a high-ranking priest, or sometimes the pharaoh, washed, anointed, and elaborately dressed the deity’s statue before presenting it with offerings. Once the deity had consumed the spiritual essence of the offerings, the items themselves were distributed among the priests. There were still quite a few less frequent temple rituals, or festivals, with dozens occurring every year. These festivals often went beyond simple offerings to the deities, and could involve anything from reenactments of particular myths to the symbolic destruction of the forces of chaos. Most of these events were likely celebrated only by the priests and took place only inside the temple. However, the most important temple festivals, like the Opet Festival celebrated at Karnak, usually entailed a procession carrying the deity’s image out of the sanctuary in a model barque to visit other meaningful sites, such as the temple of a related deity. Commoners would gather to watch these processions, and sometimes received portions of the unusually large offerings given to the deities on these occasions. At many sacred sites, the ancient Egyptians worshipped individual animals, which they believed to be manifestations of particular deities. These animals were chosen based on specific sacred markings, which were believed to demonstrate their suitability for the role. Some of these cult animals retained their positions for the rest of their lives, as with the Apis bull worshipped in Memphis as a manifestation of Ptah. Other animals were chosen for much shorter periods. These cults grew more popular in later times, and many temples began raising stocks of such animals from which to choose a new divine manifestation. The ancient Egyptians used oracles to ask deities for knowledge or guidance. These oracles are known mainly from the New Kingdom onward, although it’s likely they appeared much earlier. 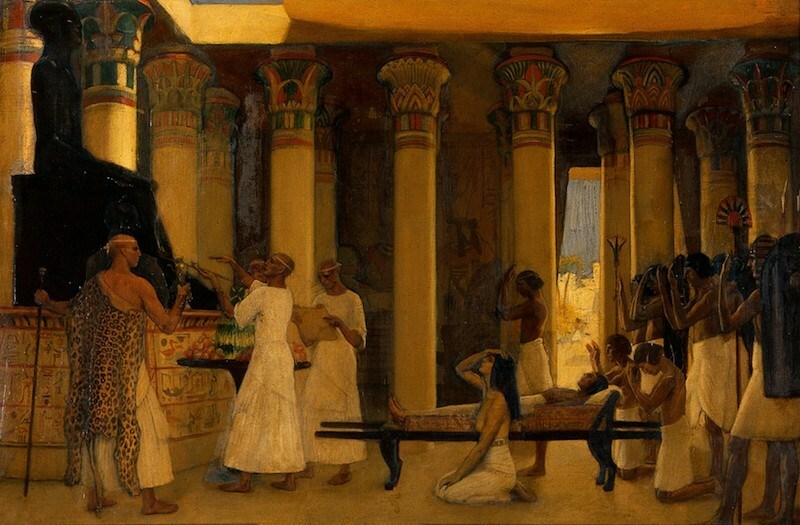 People of all classes, including the pharaoh, asked oracles questions and, especially in the late New Kingdom, their answers could be used to settle legal disputes or inform royal decisions. The most common way to consult an oracle was to pose a question to the divine image while it was being carried in a festival procession, and then interpret an answer from the barque’s movements. Other methods included interpreting the behavior of cult animals, drawing straws, or consulting statues through which a priest apparently channeled. The means of discerning the deity’s will conferred a great deal of influence onto the priests who channeled and interpreted the deity’s message. Popular religious practices included ceremonies marking important transitions in life, such as birth – because of the danger involved in the process – and naming, because the name was believed to be a crucial part of a person’s identity. The most important of these ceremonies were those surrounding death, because they ensured the soul’s survival beyond it. Other religious practices sought to discern the deities’ will or seek their knowledge. These included the interpreting of dreams, which could be viewed as messages from the divine realm, and the consulting of oracles. People also attempted to affect the behavior of the deities, in order to benefit themselves, through magical rituals. The word “magic” is the closest translation of the ancient Egyptian term heka. Heka was considered a natural phenomenon, the force that created the universe and which the deities used to work their will. Ancient Egyptians believed that humans could also use heka, and magical practices were closely intertwined with religion. In fact, even the regular rituals performed in temples were considered to be magic. Individuals also frequently used magical techniques for personal goals. Although these purposes might harm others, no form of magic was considered harmful in itself. Instead, magic was seen primarily as a way for humans to prevent or overcome negative occurrences. Science is “the intellectual and practical activity encompassing the systematic study of the structure and behavior of the physical and natural world through observation and experiment.” We all perform scientific acts each and every day. Being aware and present in our actual work, home life, educational pursuits, and leisure all encompass some aspect of “science,” as described above. Do we not learn relationship interaction through observation and experimentation? Of course we do! Do we study others and then experiment with things like cooking, clothing ourselves, cleaning the house, and raising children? Absolutely. Life is science. And yet… there are the science doubters. The Washington Post did an article, in 2015, on science doubters. Entitled, “Why is Science so Hard to Believe?” the article goes on to discuss confirmation bias, the discipline of the scientific method, and why so many people would rather believe media hype or misinformation from friends rather than actual science. Media is not science and it is not gospel. We consume the media that’s easy to consume rather than do the work for ourselves. It’s easier to doubt than to verify. Neil deGrasse Tyson has an interesting quote: “The good thing about science is that it’s true whether or not you believe in it.” He also said that “the universe is under no obligation to make sense to you.” Both of these quotes speak to the hubris of humans – we think we know much more about the word than we really do. In a quote from an article on National Public Radio, the author quoted his friend, a professor of Jewish philosopher, as saying “science tries to make magic real.” The author goes on to specifically outline activities, now commonplace human activities, as ones that we once thought of as magical, for example, flying. We fly without a second thought; yet, 500 years ago, to say one flew was heresy, possibly leading to death. Other examples are the knowledge of “invisible” animals capable of making humans ill, or being able to see great distances into space (the past) through a telescope. The ability for our phones to “think” and talk with us would have been quite astounding to the medieval mind. The author continues his journey with the main difference between science and magic: his belief is that the power of magic originates within us, where as science’s power originates outside of humans. Science is a set of immutable laws of the universe. Right? Well, no. Science updates theories based on knowledge gained from further expressions of the scientific method, and then new theories are postulated. Science is evolving, a never-stagnant set of data that we are constantly testing and proving or disproving. Magic is generally seen as not obeying the laws of nature, being outside of those “rules” or “metaphysical,” as it were. Yet, we’ve all said it: couldn’t what we see as magic just be unexplained scientific laws that we do not understand quite yet? Why are Freemasons charged to examine and study nature and science? Nature AND science? It seems that it might be because the world is made up of both the understood and the mystery. We have many questions to answer about nature and we use science to get there. Perhaps we could say we have many questions to answer about magic and science is the method. There’s no reason we can’t have wonder and reason hanging out together in our minds. We can appreciate the brilliant stars and the awe of an eclipse and still want to know how it happens. Knowledge does not take away wonder. I want to believe that perhaps science and magic are part of the same evolutionary cycle – what starts out as magic becomes understood by science, which breeds questions within our curious minds, wonder at something unknown, triggering us to embrace the tools of science to explore. Freemasons get to play in both realms, being co-creators on the path of humanity.